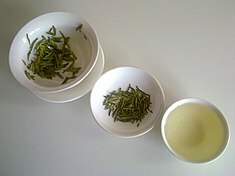 The appearance o green tea in three different stages (frae left tae richt): the infused leafs, the dry leafs, an the liquid. Notice that the infused leafs leuk greener nor the dry leafs. Green tea is made frae the leafs frae Camellia sinensis that haes unnergaun minimal oxidation throu the processin. ↑ Khan N, Mukhtar H (2013). "Tea and health: studies in humans". Current pharmaceutical design (Literature Review). 19 (34): 6141–7. PMC 4055352  . PMID 23448443. This page wis last eeditit on 23 Dizember 2015, at 21:02.